Chain Link Fence Slats - Winged Style | Hoover Fence Co.
Use our Chain Link Fence Slats in the Winged Style to add privacy to your existing chain link fence. These PVC fence slats are designed to provide maximum privacy to your chain link fence. The 'wings' are a ruffled edge along both sides of the slat that is created by may small cuts in the PVC material. This added step in the manufacturing process creates a privacy solution for your chain link fence that is very secure as well because the wings allow the slat to grip the chain link wires and hold it in place without an added locking strip. The Winged Chain Link Fence Slats provide approximately 90% privacy when installed. We are proud to offer privacy slats for 4', 5', 6', 7', and 8' high chain link fences. If you have a fence that is higher than the measurements shown, you can always double a common height to accomplish the task (i.e. If you have a 10' high chain link fence, simply use (2) 5' slats). Color options include Black, Brown, Green, White, Tan, Grey, Blue, and Redwood. Our winged slats are sold in bags which provide approximately 10 linear feet of coverage (each bag contains 82 individual slats). All slats are also approximately 2" shorter that the actual height of fence. To install, simply slide the slats down from the top, into the channel that is created during the manufacturing of the chain link fence fabric. No special tools are needed, but a pair of Fence Pliers come in handy to straighten any wire that is deformed or bent. Sometimes it helps to have a bucket of soapy water on hand to lubricate the slats for ease of insertion. Note: The Winged Chain Link Fence Slat is designed to work with a fence that has a 2" mesh size. 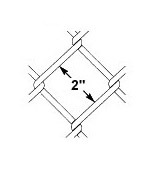 This means that they will typically work well with an 11 gauge, 9 gauge, or 6 gauge chain link fence mesh. It is best to double check your mesh size before ordering.